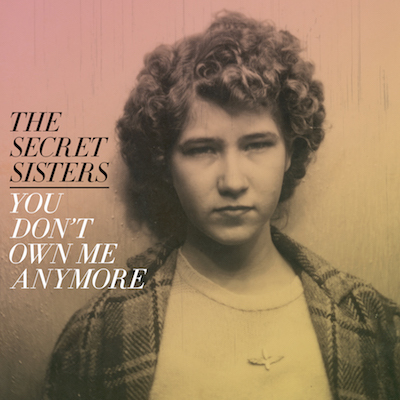 The Secret Sisters (Laura And Lydia Rogers) have signed to New West Records and are set to release their first new album in over three years, You Don’t Own Me Anymore, on June 9. The 12-song set was produced by Brandi Carlile and collaborators Tim and Phil Hanseroth. NPR Music is premiering a new video for the album opener “Tennessee River Runs Low” today which features acclaimed Alabama artist Butch Anthony. The clip was shot on his 80-acre family compound where he hosts the “Doo Nanny,” an annual art/folk micro festival. The duo’s return to recording follows a dark period for them after the release of their sophomore CD Put Your Needle Down in 2014. They lost their label deal and ultimately found themselves with barely enough money to stay on the road and keep making music. To make ends meet, Laura took a job cleaning houses and the girls performed when they could, until Brandi Carlile offered to produce their next record. A PledgeMusic campaign raised half of their goal in just 48 hours, with fans coming forward to help them rebuild their career. Pouring their emotions from the struggle into the new project, the resulting songs of You Don’t Own Me Anymore focus on what happens in life when everything you think defines you is suddenly stripped away. The Secret Sisters will also tour in support of the new album beginning May 13th in their hometown of Florence, Alabama. You Don’t Own Me Anymore will be available digitally, on CD and vinyl, and is available for pre-order via PledgeMusic.